One speck of dust is all it takes to start building a cloud. As nearby water vapor condenses on that piece of dust, the growing cloud collects more and more dust and vapor until a massive cloud has formed. Debt can grow in much the same way. One large purchase, one late payment, or one bad day can be enough to trigger a series of events that lead to a massive debt. And, like a cloud blotting out the Sun, the larger that debt grows, the darker your outlook can become. Thankfully, debt has something else in common with a cloud: it won’t rain on your parade forever. You can get out of debt. Though it may not be as easy as escaping a rain cloud, becoming debt-free involves only four simple steps (and a lot of hard work). The very first step to paying down your debt is to figure out who and how much you owe. For most debts, this information can be found by checking your credit reports. Each consumer has three main credit reports, one from each of the three major credit bureaus: Equifax, Experian, and TransUnion. You can get a free copy of each credit report once a year through AnnualCreditReport.com, which is operated by the three major bureaus in accordance with the Fair Credit Reporting Act (FCRA). Your credit reports should show all of your current (and up to 10 years in the past) credit lines, their status — whether they’re in good standing or delinquent — and the amount of credit and/or debt associated with the credit line. You should check all three credit reports when determining your debts, as each credit bureau collects data independent of the other bureaus. This means some credit lines may only show up on one or two of your reports and could be missed if you don’t look at all three. Additionally, some debts may not be reported to the credit bureaus. These can include things like loans from individuals — for example, a loan from a family member that isn’t reported to the credit bureaus — as well as some utility debts (if you fall behind on your electric bill, for instance, it may not be reported to the bureaus). Once you’ve collected the necessary debt information, it can be helpful to list your debts all in one place, such as in a spreadsheet where you can easily organize the data. This will help you in the next step: making a plan. The second step is where the hard work begins. With all of your debts laid out before you, it’s time to come up with a repayment plan. Unfortunately, there’s no “one size fits all” when it comes to paying down debt; the best method for you will depend on your specific situation. In general, you’ll save the most money by paying down your debts in order of interest rate (from highest to lowest), though working from the smallest to largest debt can be more effective for some people thanks to the boosts of motivation from closing out small debts. And some people may prefer to split the difference. For example, if you have a good amount of high-interest debt, then part of your plan may include consolidation. By using a personal loan with a lower interest rate to consolidate your high-interest debts, you can often make repayment easier. No matter which strategy you employ, of course, any delinquent accounts should have priority over everything else. If you’re behind on a debt, each additional 30 days you let that account stay delinquent can mean tens of points off of your credit score, and an account that gets charged off can do even more damage. Also, regardless of which debts have priority, be sure to make at least the minimum required payment on every account to avoid falling behind. Late payments come with late fees and can also cause credit damage if left too long. Once you’ve determined the repayment order, it’s time to build a budget. This involves taking your net monthly income and dividing it into segments based on your expenses. While housing and food are obviously high priorities, ensure that paying your debt is also a priority — one with a much higher rank than frivolous things like a new phone or a bigger cable package. When building your budget, give every dollar of income a specific role, whether it’s for bills, debt, or a little spending money. With a budget in hand, it’s time for the hardest part: staying diligent. As important as it is to stay on track, the first budget you build may not be as practical in practice as it was on paper. Don’t fret. Budgets are adaptable, and it can be beneficial to tweak your budget as you go to ensure it stays realistic to your actual financial situation. However, be smart about what changes you make to your budget. Don’t take money from your debt repayment pile to increase how much you can spend on frivolous purchases; five minutes of fun now is rarely worth several extra months of indebtedness. At the very least, be sure you’re making all of your minimum payments on time to avoid damaging your credit. You should also try to avoid taking on any new debt while you’re working to pay off your current debt. Sometimes, despite our best intentions, we simply don’t have the knowledge or means to tackle our debt alone. In this case, ask for help! There is no shame in seeking out professional advice when you’re in a bind; in fact, the larger shame is wallowing in debt because you’re afraid to seek assistance. Now, that doesn’t mean looking for some sort of financial handout. Instead, it means finding a financial professional who can help you build a better plan, guide you through any confusing aspects of your situation, and suggest options you may not know about otherwise. 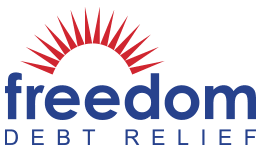 Debt relief companies, for instance, tend to offer a range of services intended to help consumers repay their debts. This can range from counseling to debt settlement, and many options in between. Most, like our expert-rated picks, even offer free consultations to help you see if it’s a good fit. When looking for a financial professional for advice or debt relief services, be sure to do your research. A good debt relief company will tailor its services to your situation, rather than upsell you incompatible services. You can investigate financial services companies online through independent rating sites, like the BBB and Consumer Affairs, as well as read customer reviews. Additionally, most financial services sectors have organizations that regulate their industry as well as professional organizations that can give you an idea of the company’s reputation. And don’t forget about the internet. While you should take any financial advice from a blog or forum with a grain of salt, the internet can be a valuable resource if you just need a little advice or guidance but don’t want to hire a professional. The internet can also be a valuable resource for finding ways to better your budget, including literally hundreds of money-saving tips and tricks, from ways to slim down your grocery bill to the best method for reducing your utility costs. Consumer debt comes in all shapes and sizes. Some debts are small and pass quickly, like the fluffy white clouds of a summer day. Other debts are large and intimidating, like the black clouds of a spring storm. Regardless of their nature, however, all debts (and clouds) have one thing in common: they don’t have to hang over your head forever. But while you can often simply wait for the dark clouds to disperse, your debt won’t go away in a good gust of wind. Instead, you’ll need to organize your debt, make a plan, stay diligent, and seek help when necessary. By following these four simple steps, you can finally watch your debt disappear in the breeze.